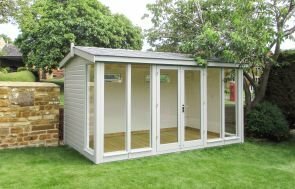 A small, but highly practical building, this Salthouse Studiohas been installed in our customer’s garden in Hampstead Norreys, Berkshire to use as an office for the customer to work in from home. At 1.8 x 2.4m in size, this is only going to be a small office, but it is all the customer needs to put in a desk and a chair to work on his laptop inside. The Salthouse is a modern looking garden office, with a sloping pent roof and a full-length glass door and windows (these are all double glazed). Heavy duty felt has been used on the roof, which is a thick, construction grade felt that will last 12-15 years, and the building has been finished in the colour Slate, from our Valtti paint range. Valtti is an opaque paint system that has a long re-decoration cycle. Internally, there is natural matchboard lining on the walls for a warming effect, as well as full insulation. The customer didn’t opt for our electrical pack, but they had their own electrician on the day set up the wiring while our installers put the building up. While this is only a small building, it is going to do exactly what the customer wants it to, which is to provide him with a quiet spot to work, away from the hustle and bustle of their house, while he’s at home. 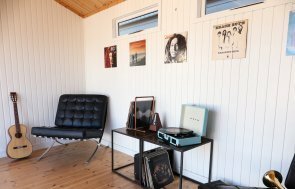 For more information on our Garden Studios, please call us on 01760 444229 or Contact Us online to send us your enquiries.